From the 'Typus Orbis Terrarum', German Text - Striking continental map designed by Ortelius from elements of contemporary maps by Gastaldi, Mercator, and Forlani. 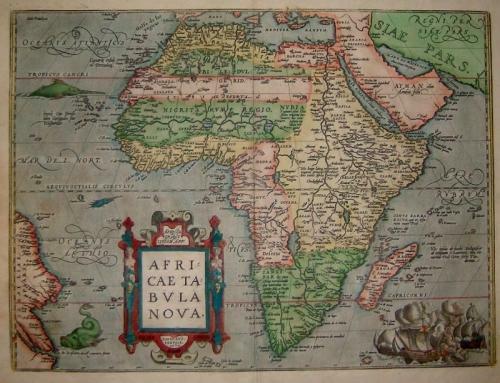 It is considered a cornerstone map for African collections. The name Carneca appears for the first time, and Zanzibar is shown on the west coast. The Nile is based on the Ptolemaic concept. The map is decorated with a strapwork title cartouche, a grand sea battle, swordfish and a whale. There is no sign of the so-called ghost-like sea monster off the coast of Arabia. A very good impression and original colouring on quality paper with wide margins. There is a 10 cm centerfold repair that has been professionally done and is not noticeable from the front of the map. Overall a beautiful example of a cornerstone map in very good condition. Ref: Norwich #10; Van den Broecke # 8.